Healthaid HEALTHAID TEENVITAL (MULTIVITAMIN & MINERALS WITH LUTEIN) Product #: 4.0 stars based on 1 reviews 5.0 1.0 SOM Price: Rs.895.50 Rs.895.50	Available from: SAVEONMEDICALS.COM In stock! Order now! Teenvital Tablets are designed for teenagers. During teenage years the demands on the body are particularly taxing due to the enormous stress and strain of everyday life coupled with the pressures of educational performance. This can sometimes take its toll on the body making one feel weak, tired and exhausted. This then reflects on the body and skin condition. Its at times like this that a daily intake of the right supplement can help maintain the body and keep the skin in peak condition. What is the frequency of use of HEALTHAID TEENVITAL (MULTIVITAMIN & MINERALS WITH LUTEIN)? Have you been prescribed HEALTHAID TEENVITAL (MULTIVITAMIN & MINERALS WITH LUTEIN) by a doctor? How do you rate HEALTHAID TEENVITAL (MULTIVITAMIN & MINERALS WITH LUTEIN) on price? This page was last updated on 02-05-2018. Q1) Is HEALTHAID TEENVITAL (MULTIVITAMIN & MINERALS WITH LUTEIN) effective? Q2) What is the frequency of use of HEALTHAID TEENVITAL (MULTIVITAMIN & MINERALS WITH LUTEIN)? Q3) Have you been prescribed HEALTHAID TEENVITAL (MULTIVITAMIN & MINERALS WITH LUTEIN) by a doctor? Q4) How do you rate HEALTHAID TEENVITAL (MULTIVITAMIN & MINERALS WITH LUTEIN) on price? 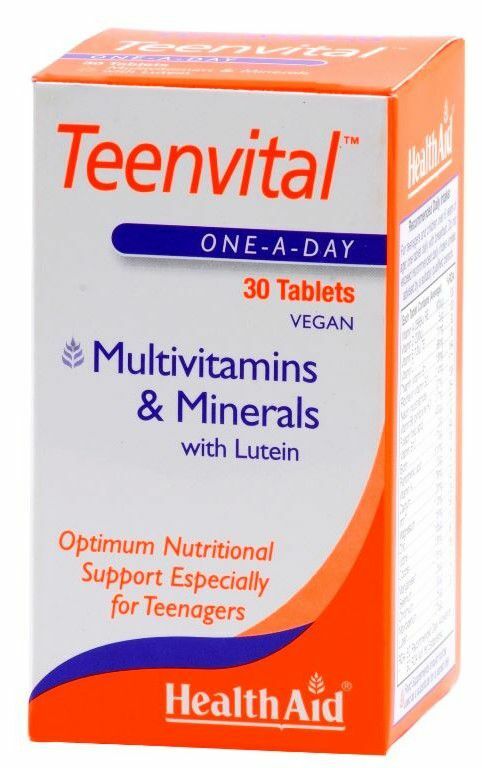 Q5) What is your overall rating of HEALTHAID TEENVITAL (MULTIVITAMIN & MINERALS WITH LUTEIN)? Is HEALTHAID TEENVITAL (MULTIVITAMIN & MINERALS WITH LUTEIN) effective?